Actress Sofía Vergara will launch her second fragrance, Love by Sofía Vergara, next month. Love was developed by perfumers Yves Cassar and Pascal Gaurin. The notes include mandarin, green apple, orange blossom, coffee blossom, magnolia, orris, amberwood, praline and vanilla. 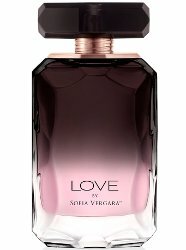 Love by Sofía Vergara will be in 30 and 100 ml Eau de Parfum, and will be sold at HSN and Perfumania.